Yesterday at the Sustainable Energy for All Forum in Lisbon, Portugal, Dalberg Advisors announced the main findings of a study on scaling clean bio-ethanol cooking fuel in Kenya. This independent report was commissioned by the Mobilising Investment project, a joint initiative of CDKN and the Low Emission Development Strategies Global Partnership funded by the German government’s International Climate Initiative (IKI). The project is delivered in seven countries across Asia, Latin America and Africa. SouthSouthNorth, the new lead for CDKN, manages the project and implements it in Kenya and Ethiopia. The use of fuels like charcoal and kerosene for cooking in urban areas of sub-Saharan Africa has increased steadily for the past few decades, including Kenya, with significant negative impacts on people’s health and the environment. In Kenya, 16,566 deaths annually are currently attributable to indoor air pollution, and the country loses 10.3 million cubic metres of wood from its forests every year from firewood and charcoal consumption, a major contributor to the country’s 0.3% annual deforestation rate. In many African countries, household energy for cooking is the single largest energy user, followed by heating and lighting. Liquid petroleum gas (LPG) usage is growing in urban Kenya, but it is still confined to wealthy households, despite tax exemptions and subsidy programmes. To date, charcoal and kerosene continue to dominate the market for lower-income households because of their accessibility and low cost. 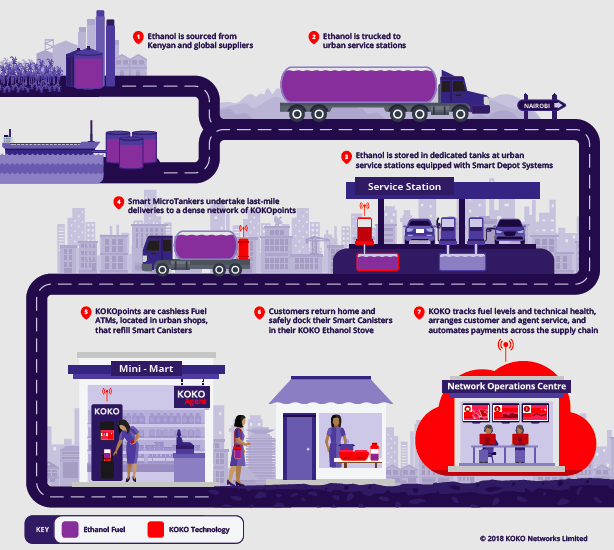 The Dalberg study assessed the economic, health and environmental benefits of bio-ethanol and LPG to understand the impact of replacing traditional fuels. It found that transitioning Nairobi households from kerosene and charcoal to bio-ethanol cooking fuel could result in up to 2.4 million tons of avoided greenhouse gas emissions per year, and prevent at least 1,500 deaths per year from indoor air pollution. It is likely to also prevent many more deaths from the less quantified impacts of household air pollution, including kerosene-related burns and poisonings. Despite the social and environmental benefits of bio-ethanol cooking fuel, the consumer retail price of $0.85 per litre includes 25% import tariffs and 16% value added tax (VAT). LPG, by comparison, is exempt from both VAT and import tariffs. If bio-ethanol cooking fuel had similar tax and tariff exemptions, it would become the lowest-cost cooking fuel in Nairobi. With these regulatory changes alone, bio-ethanol can offer a viable clean cooking fuel to even the poorest households currently using kerosene. CDKN will share the full report once released in the coming weeks. Visit Facebook Live to watch back an interview of James Mwangi, Executive Director of Dalberg Group, and Carl Wesselink, Director of SouthSouthNorth, discussing the report at the Sustainable Energy for All Forum.